The beautiful Scheherazade was under an execution order by her husband, the Sultan, but kept telling him such good stories at bedtime, that every evening for 1001 nights, he postponed the event to hear the next episode. Media: Head, arms and feet of tinted Super Sculpey, on a wire armature, with a cloth body. Long black mohair with a red and gold tulle veil and gold jewelry. She has gold sandals. 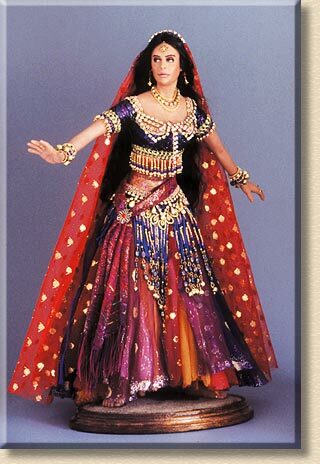 Her skirt is made of layers of purple, orange and red tulles and organdies. Her fabric midriff is tightly covered with a metallic red fabric. Her belt is made from several gold trims, a fancy rhinestone chain, and beaded chains with gold beads and blue stones.. Her bodice is a blue and purple metallic brocade edged with gold trim and beaded fringe. She wears rhinestone necklaces, gold chains, gold earrings and pendant on her forehead, gold beaded bracelets with bells, and a red tulle veil.